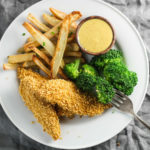 Crunchy and gluten-free, these 3-ingredient Low FODMAP Chicken Tenders are AH-mazing! Make these kid-friendly tenders even better with some creamy maple mustard. DE-licious! Preheat oven to 450°F. Line a baking sheet with aluminum foil and spray with nonstick cooking spray. Whisk egg in a shallow bowl. Place corn cereal in a ziptop bag and finely crush with a rolling pin. Pour crushed corn cereal onto a plate. Dip each chicken tender into egg and roll in corn cereal to coat. Place on baking sheet and repeat. Discard any remaining corn cereal. Bake for 12-15 minutes or until cooked throughout, flipping halfway through. Serve warm. Corn Flour: As a cereal flour ingredient, corn flour is low FODMAP in ⅔ cup or 100-gram servings. This is further discussed in the narrative above the recipe. Cornflakes: A low FODMAP serving (in the US) is a ½ cup or 15 grams.